Even before the halftime show took place on Sunday, February 3rd, Maroon 5 had already been raising controversy regarding their upcoming performance. It has been a past tradition that the group and/or individuals who were headlining the show to participate in a press conference to discuss the performance. Prince, Beyonce, Lady Gaga and many greats before them took park in this tradition. This year, however, Maroon 5 decided to cancel the conference, raising a lot of suspicion. It was unclear whether or not this has to do with controversy regarding former NFL player Colin Kaepernick, who was fired from the NFL after taking a knee during the national anthem, or a decision made by the band for their own sake. They may not have desired to field questions involving this topic, but claim that they chose not to partake in the conference simply because they wanted their performance to speak for itself. They wanted to focus on the show and give the best possible performance to the viewers. Despite this, the show fell short in several components. The set up of the show saw Maroon 5 taking center stage on a giant M that changed color as they went from song to song. They brought in an excessive amount of affects, shooting fire off like there was an unlimited supply, and setting off fireworks outside the stadium to bring up the excitement during the performance, attempting to distract from a show that left most fans commenting “that’s it?”. Maroon 5 mixed in some of its oldest hits to try and give fans a taste of their better days, since that did not come out of the halftime show. While “This love” ignited sing alongs near and far, and featured and epic guitar break by Levine and a fellow band member, it was only the lead up to disappointment after months of speculation. After the death of spongebob creator Stephen Hillenburg back in November of 2018, fans of the show banded together and started a petition, attempting to get the band to include “Sweet Victory” in their performance, the source of one of the most beloved scenes in the shows history. As Maroon 5 went on, a clip of this famous moment graced our tv screens, only to lead up to the introduction of Travis Scott, whos performance had to be muted so many times viewers could barely understand a word he said. After so much anticipation, to only tease Sweet Victory just set the mood for how disappointing the rest of the show would be. Levine did managed to make a slight improvement to the show, taking over from Scott with “Girls Like You”, which included a choir and a drum line. Possibly the only great moment of the show was the band’s rendition of “She Will Be Loved”, which saw the stadium fill up with glowing paper lanterns, seeing some form the words “One Love” in the sky, was honestly a special moment that fans held onto, considering it was one of the few quality moments in the show. Big boi made a less than impressive entrance, driving onto the stage in a car and over dramatic fur coat, setting the tone for his mediocre performance, which was just as hard to understand as Scotts. The only redeeming quality to Scotts and Big Boi’s performances was watching levine awkwardly dance alongside them. 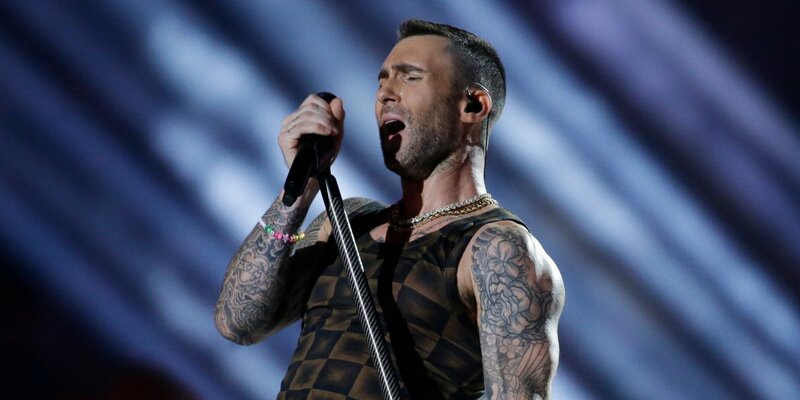 Once big boy was finished, Maroon 5 attempted to redeem the show with “Sugar” and “Moves like Jagger”, with Levine taking off his Jacket and shirt, as if that could save the show at the last second. Overall, the best part of the the show turned out to be the memes that came after it, which agreed on one thing only: this show is not going to land among the greats.